With the fate of the worlds at stake, good and evil will collide in the ultimate battle as only the last Gunslinger Roland Dechain (Idris Elba) can defend the Tower from Walter O’Dim (Matthew McConaughey), the Man in Black. BE WARNED. I’ve never read the Stephen King novels so do NOT murder me for saying that I found this quite watchable. From the scathing ratings on Metacritic, I expected something so much worse. BUT I’m sure if one of my favourite franchises that span SEVEN books was dumbed down and condensed into a 90 minute film, I might feel completely differently. The strange opening certainly got things going with the credits explaining about a dark tower protecting the universe from darkness and some guff about only the mind of a child bringing it down. Cue kids strapped in machines and some weird rodent creatures disguising themselves as humans (No wonder this had a 12A rating). Dark BUT engaging as the film flicked back and forth between “worlds” from Roland’s civil war stand-off to Jake’s apocalyptic nightmares. I thought Tom Taylor played the role of Jake quite well. I couldn’t stand him in BBC’s Doctor Foster. Bullied at school, plagued by visions of the Man in Black. Paranoia or something more? Matthew McConaughey lapped it up as Walter O’Dim. What a name! About as bad as his hair: “You will lose that power you have to resist my magics”. Waving his hand around like a Jedi and dispensing commands: “Hate, kill each other, stop breathing”. Creepy. The pace didn’t really mess about. It jumped from one scene to the next establishing Walter and Roland’s rivalry as well as Jake being the key to . . . everything. Snore. It took a good half hour before Elba’s gunslinger (Steady now) was brought into the fold properly. A man hell bent on vengeance. Elba bossed it and worked worked well with Taylor to make that inevitable pairing much more bearable. The special effects were quite impressive and Rasmus Videbaek’s cinematography was brilliant. Aided by another stellar score from Junkie XL (Mad Max: Fury Road). 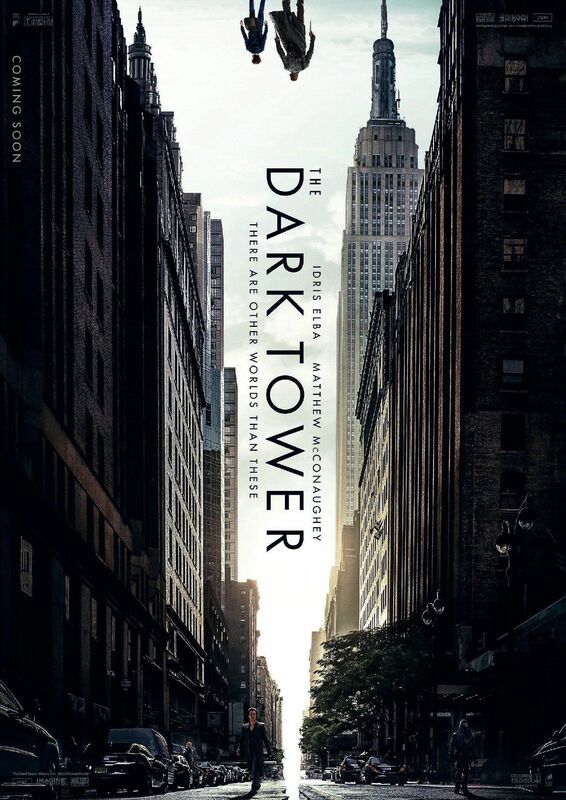 The main issue I had with The Dark Tower was that it felt a little too rushed. All that build up and promise for a mad dash finale that didn’t seem to leave much open. If there was supposed to be more sequels . . . I had so many questions: “What was the deal with the rat things? Was it all magic and sorcery? Why alternate dimensions/realities?”. It took me an hour to realise that there were different versions of Earth. One still dormant in the 18th Century with futuristic gizmos apparently? Wild Wild West, this ain’t. I was a little disappointed that McConaughey and Elba spent so much of the movie apart. When they were on screen together, it was gold. Roland’s encounters with “the Earth people” were quite entertaining; “You have forgotten the faces of your fathers”, he solemnly declares to some drunk ladies on a bus as they try to chat him up. If anything, I wanted more. 90 minutes wasn’t enough and it didn’t make full use of the supporting cast. You had Watchmen‘s Jackie Earle Haley playing such a measly role. BUT not as disappointing as Katheryn Winnick’s role. You had Lagertha from Vikings at your disposal. Why give her such a weak part? Don’t get me wrong, there was enough emphatic exchanges between her and Taylor to make you feel for the mother and son. BUT again . . . it was NOT enough. The action sequences were entertaining. I just wish there was a little more inventive gun play. Considering this was the last Gunslinger who reloads quicker than the human eye, he still seemed a little laboured shooting from the hip . . . No, sorry. The heart. How did that annoying chant go? There are blockbusters that push for the 120-150 minute mark when they really shouldn’t (*Cough* Transformers *Cough*) BUT I would have been happy to explore this universe a little more. Shame. And that was someone who didn’t read the books. DT offered action and entertainment to kill the time BUT it felt like it was afraid to take a chance and flesh out the stories involved. Thank you! It’s not that bad hehe. Fun enough. Made me want to read the books for the right/wrong reasons. I think one of the major problems fans of the books had was they didn’t realise they were watching a sequel to the books, not a movie version, as weird as that sounds. A big part of the books is that this whole thing repeats many times only slightly different and you are watching one of the repeats. When viewed that way it’s better, tho still dull. Ah I see now. Don’t get me wrong it was watchable. But there was a lot of hate. If anything, for its flaws, it has made me want to read the books. Apparently a TV show has been green-lit. Making out that the movie didn’t happen haha.